Proving that microloans can help to change the world one little bit at a time, Kiva.org hit a major milestone today. Since it’s founding four years ago, it has now made possible $100 million in microloans between individual lenders and entrepreneurs all around the world. The company has brought together 573,000 lenders (people like you and me putting in $25 or more towards a specific project), and 239,000 entrepreneurs. Most of the entrepreneurs who benefit are in developing countries, but Kiva opened up its service to needy U.S. entrepreneurs last summer (which caused some controversy, but was the right decision). It also has APIs for other developers to build on its data set. 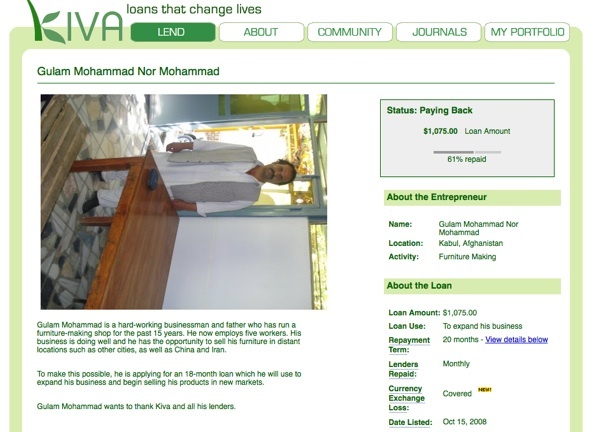 Kiva creates a personal connection between lenders and recipients. Each entrepreneur has a profile page with a picture and description of what they plan to do with the loan. Then every month you get an update on how much of the loan has been repaid. For instance, I joined other Kiva donors to give this furniture maker in Afghanistan a $1,075 loan a year ago. So far, he’s paid back 61% of the loan without ever missing a payment. You can also create lending teams on Kiva. So far the 40 people on the TechCrunch team (join here) have loaned out $5,225 spread across 183 loans. Once a loan is repaid, you can plow it back into another loan. I think of it as charitable giving, although it is not technically a charity. But the best form of charity is to help people help themselves . . . teach a man to fish and all that.